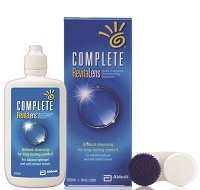 Complete Revitalens Multi Purpose Disinfecting Solution is the perfect cleaning and storage solution for all soft and gas permeable contact lenses. Ideal travel pack and letterbox friendly. RevitaLens OcuTec® Multi-Purpose Disinfecting Solution is formulated with dual-disinfection technology designed specifically for soft contact lenses, including silicone hydrogel lenses. Dual disinfectants and a surfactant deliver robust cleaning and effective disinfection. While the lens is soaking, the surfactant loosens and removes the protein and other deposits that commonly accumulate during lens wear. Dual disinfectants work to destroy microbes on the surface of the lens and provide safe contact lens storage up to 30-days. This formulation increases ocular comfort for wearers of the most common soft contact lens materials and conditions the lenses.